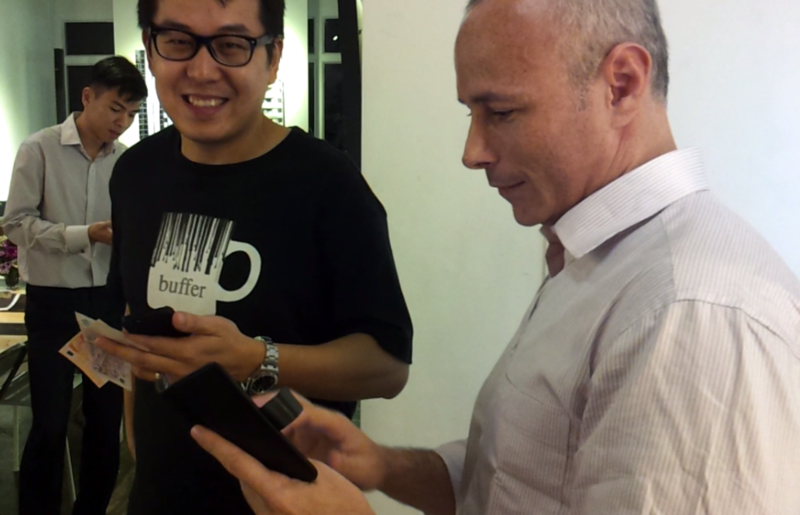 David Moskowitz has attended a couple bitcoin related meetups in Singapore. During the second meetup he decided to organize Singapore’s 1st Satoshi Square, with open outcry bidding letting folks exchange between Singapore Dollars and Bitcoins. We had the opportunity of chatting with him about the experience and hearing his perspective on being a Bitcoin user from Singapore. Ruben Alexander: When did you first hear about Bitcoin? David Moskowitz: My main business is helping people set up subscription websites and payment systems are a big part of that setup. I had heard of BitPay a couple of years ago as a possible payment solution, but didnt look into it. There were plenty of payment systems available, and I didnt see the need to add another one. Im definitely not an early adopter of technologies I tend to wait and see how they develop. For products, there’s usually a good price drop as well if you are willing to wait. Then about 6 months ago, in a forum for the software I deal with someone pointed out accepting bitcoin again, and I took a deeper look. Soon after that the media started talking about it and suddenly interest really shot up. I asked the software vendor to add taking bitcoin to their release schedule. I bought my first bitcoin about 2 months ago (after the May correction) and have now started integrating it into the systems I set up for my own sites. RA: What inspired you to start Singapores first Satoshi Square? DM: I think initially the thought came when I heard that the bar we would have the meetup at would be accepting bitcoin. I figured there may be some people there who may want to buy some to use to buy drinks and an open outcry seemed like a fun way to do it. I proposed the idea to the meetup organizers and they okd it. RA: What typically has been discussed at these meetups? DM: At the one I went to it was general networking with other bitcoin enthusiasts discussing how they got into bitcoin, how they are buying/selling. Sharing some ideas on how to spread the word about bitcoin. We also discussed some ideas for possible business ventures in the space. The rest of this interview can be seen in Bitcoin Magazine issue 13. Japanese crypto and blockchain company bitFlyer released the results of a study assessing the public confidence in bitcoin and crypto assets of 10,000 people across 10 European nations. In what the Manhattan District Attorney calls the first crypto money laundering conviction in New York, two defendants have pleaded guilty to running a drug trafficking business that laundered millions of dollars in Western Union and crypto payments. The Royal United Services Institute finds that as North Korea continues to circumvent international sanctions, it’s turning its attention to cryptocurrencies such as bitcoin. This may make Southeast Asia vulnerable to the nation’s cryptocurrency activity. The U.S.-based cryptocurrency exchange Coinbase will shut down its Chicago office and scale back plans for a high-frequency trade matching engine.